Compliance officers are experiencing regulatory fatigue and overload in the face of ever-changing and growing regulations. How they deal with the onslaught depends upon their resources and risk profile, among other considerations. In seeking out new strategies for seeing over the pile of data and keeping pace, many firms are turning toward financial technology (fintech) specifically targeted to compliance management, or what is referred to as regulatory technology (regtech). The Thomson Reuters survey analyzed the compliance costs financial services firms are anticipating and accounting for when budgeting both time and monetary resources. Their growing dependence on regtech was queried. More than 300 firms worldwide responded, including most of the largest systemically important financial institutions. 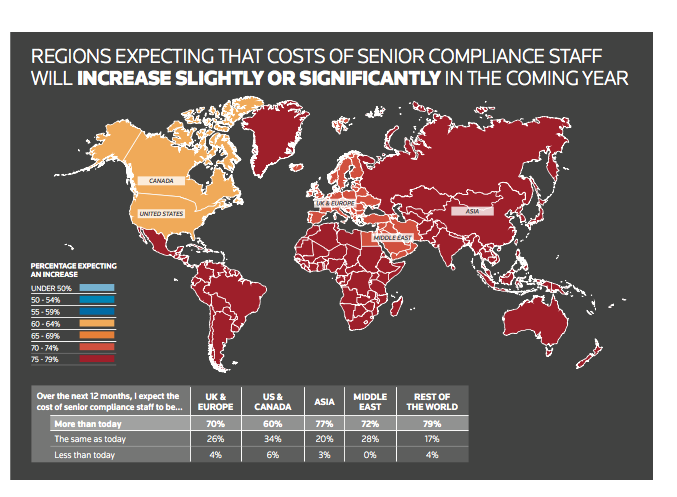 The resulting Cost of Compliance Report published in July of this year outlined the significant impact the barrage of compliance imperatives have had on compliance and risk professionals in such firms. A full 69 percent of firms are expecting regulators to propose even more rules in the coming year, with 26 percent expecting significantly more. In the face of this expectation, two-thirds (67 percent) of firms overall expect senior staff to cost more in 2016, largely due to the need for certain expertise (84 percent). If you have been feeling like this way too, the good news is twofold: your skill set is highly coveted, plus experts in the field — including even other industry participants — are often willing to share their best practices, so you can implement them as they suit your business’ needs. Regulatory imperatives are making compliance professionals turn to technology to accomplish some of the obligations they must meet on a continuing basis — from determining beneficial ownership to transaction monitoring to developing and monitoring code to detect hackers. As the remit of the compliance officer grows, so too does their involvement in such activities as assessing and remediating cyber-security risk, and being able to respond to regulators about their actions in this arena. The rise of virtual currencies, cryptography, mobile wallets, FX trades in the cloud, robo-advice and digital ledger technology — like blockchain — are creating a need for compliance officers to develop an understanding about each of them. In a demanding financial environment, applying regtech could make an important contribution to increasing the profitability and efficiency of financial institutions. This can be achieved by making compliance less capacity-demanding, improving the quality of supervision, and reducing risk in the system. The aim is not to replace the essential personal judgment of the compliance officer or the important relationships and communication between the compliance team and employees of the business. Indeed, the limitations of technology to communicate, incentivize, and establish a tone of compliance that goes beyond rules to an ethos of goodwill all serve to keep the compliance professional’s role and stature intact. Several of the world’s regulators such as the UK’s Financial Conduct Authority (FCA) and Singapore’s Monetary Authority (MAS) have established a "safe space" within which firms can begin testing new technology solutions. Enabling firms to test these solutions without immediately having to satisfy the regulatory requirements that would normally apply will give companies the time to appreciate whether they are suitable to their businesses and risk profiles. In the United States, the Office of the Comptroller of the Currency (OCC), the Consumer Protection Financial Board (CFPB) and the Securities and Exchange Commission (SEC) have begun developing frameworks for how they will evaluate new financial technology products, services and processes. Stacey English is head of regulatory intelligence for Thomson Reuters with 20 years' regulatory compliance, risk and audit experience in financial services as a regulator and practitioner.Susannah Hammond is a senior regulatory intelligence expert with over 25 years' wide-ranging compliance, regulatory and risk experience in international and UK financial services.